Photo courtesy of Tiffany Kinney. If you don’t love liquor we don’t want to hear your boos! Hey Ho, Let’s Go, hic! I’ll just go and beer myself. Love means never having to say you’re sober. I love liquor and here’s the proof. You Are Welcome To Vomit Again! Years ago I saw a tavern where there was a temporary painting of a drunken Santa Claus on the window. @Yu No Hoo: fine, as long as it’s at least 80 proof. – Have you been drinking, Madam? – Not at all, Officer! – You want to tell me you’re driving completely sober, no speech difficulties or silly walk and even without drinking license? Step out of the car please. – Do you love liquor, Sir? – Ooh, hic, yesh. Verre mussh, Capt’n … Off’sher! – I see. Step … uh, fall out of the car please. Liquor in the front, poker in the rear. @Frank Burns: Liquor? I hardly know ‘er! This little piggy went to the liquor market. This little piggy stayed sober. This little piggy had 12 shots of Fireball. This little piggy had one. And this little piggy went wee-wee all the way home. 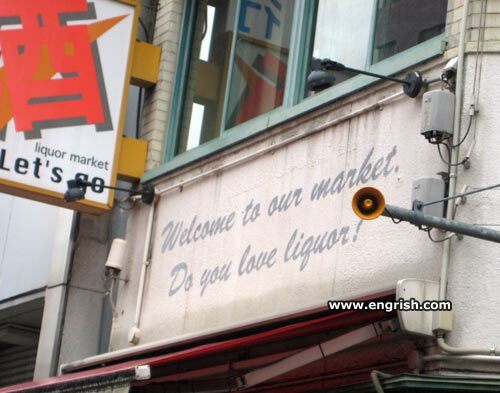 Do you love liquor? No?! Forget I ever said welcome.